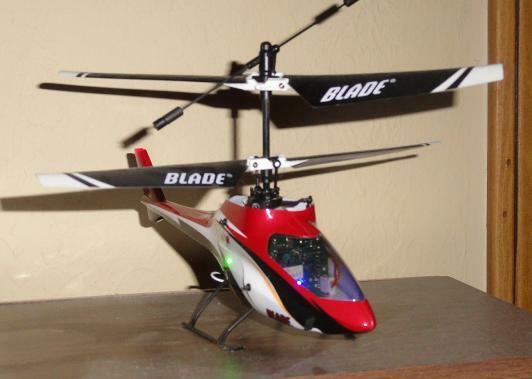 Dual blade coaxial helicopters have always been fun to fly and it also revolutionized the overall design approach in RC helicopters. After the success of MCX RTF, Blade is now offering the latest in their line of RC helicopters which is the Blade MCX2 RTF. If you are looking for a fantastic first helicopter, look no further. This is it. I just can’t say enough about how fantastic this indoor heli is. It comes in both a RTF (Ready to fly) and BNF (Bind & Fly) versions. The little 4-channel controller that comes with this works very well and has dual rates. The default is very docile and if you think it flys too slow click the stick and you are in hi-rate mode where it zips around the room quite effectively. The original mCX was the best beginner heli and now that they have the mCX2 it is just a great heli made better! Compared to its predecessor, the new Blade MCX2 offers some updated features with an added power, speed, longer flight time, and a fully detailed modern body design. This is a coaxial design so you don’t have to worry too much about stability and flying difficulty. The counter-rotating blades auto-stabilize the helicopter so that you can just concentrate on orientation, spot landings and general fun control of the helicopter. It comes with batteries and a charger in both versions. The mCX2 has cool flashing lights and in a darker (not dark) room it looks just awesome. The heli is very lightweight and because of that very durable. So long as you don’t continually smack it in to walls and furniture at full speed you should be fine. Mine has endured 20 crashes without a scratch and probably 80 flights between me and my son. It does cost more than a Wal-Mart Air Hogs toy but you get so much more helicopter and, more importantly, it will last. Replacement parts are cheap and readily available, although you probably won’t need them. In my mCX I eventually had to replace the motors simply because I wore them out. You can find this little darling at most local hobby stores for about $70-100 Also additional batteries for about $9-10 which you will want to get because once you fly it you won’t want to stop. This helicopter is for beginners but intermediate and experienced pilots will enjoy it too! The only real drawback from this helicopter is that there is no timer function available on the transmitter (it is a beginner heli after all). Since the battery is a LiPo you have a tendency to over run-down the battery and therefore shorten the battery life. So set a timer on your wristwatch to about 15-30 seconds before it starts to blink and you should get more flights out of a battery, It is very light so indoors is about the only place to fly it. Buy direct from Amazon here for the RTF ($100) and BNF ($70) . The Blade MCX2 comes in a one hundred percent factory assembled packaging and you can virtually fly it out right from the box. All models are test flown before packing which is an additional guarantee that every MCX2 will really fly. There are also other improvements that have been introduced with MCX2 and most of these enhancements enabled the RC helicopter to fly better in all aspects including improved stability and flight balance. This RC helicopter also comes with precision made swash plate and a user selectable control setting. MCX2 RTF (ready to fly) is equipped with a five in one control unit (gyro, Spektrum 2.4GHz DSM2 compatible receiver, mixer, main motor ECS, and fully proportional servos. Sleek modern body design with integrated LED flashing lights. Highly efficient double mini coreless motors powered by 120mAh 14C single-cell 3.7V lithium polymer (LiPo) battery pack. Just like the first Blade MCX RTF, the MCX2 is very easy to fly and it is also small enough to fly inside a confined space. Even beginners can easily fly this RC helicopter with ease. The MCX2 still has the same counter rotation rotor head design and coaxial blades as the previous Blade MCX but the difference is very noticeable with its user selectable swash plate sensitivity. The LED flashing lights that are integrated in the body also adds extra appeal on the overall look of the micro helicopter making it more fun to fly. The good thing about this model is that you can easily change the control programs to your preferred setting so you can make it fly faster at higher speeds. The default setting is set at low speeds so beginners will not be challenged in operating the helicopter. Slower speeds mean more stability and flight balance making it a lot easier for beginners to master the control in just a short period of time. With its head lock like performance, you can enjoy maximum control of the helicopter even when you push its powerful motors to its limits.